Daniel wraps up his "Scale Basics" mini series by sharing a few ways to make simple scales sound a bit more interesting. Ascend one and descend another. Sequence one and play another one straight through. He talks about using scales in a musical context and demonstrates his ideas over a backing track. Great inspiration....I took all the scale sequencing patterns and played them vertically up the guitar instead of horizontally and then threw in the pentatonic scales and the major arps and it really opens up the guitar to a lot of new musical ideas..Dan you Rock!!! Great lesson Dan! There is a big step here to go through which is hearing the chord change and quickly switching to the next scale. Good exercise. Thanks. This series covers scale positions, arpeggios, modes, advanced blues and more! Learn creative, outside the box ways of applying your knowledge and ideas to your improvisation. Known around the world for his inspirational approach to guitar instruction, Musician's Institute veteran Daniel Gilbert outlines his series on Improvisation. Daniel shares and demonstrates a large variety of basic and advanced scale sequences and shares his philosophy behind using them in your playing. Daniel teaches the patterns of the major pentatonic scale and discusses what makes this scale unique from its minor counterpart. He also shares two unconventional sequencing ideas. Daniel teaches the "quick change" and "slow change" blues progressions and provides a blues comp idea that he calls "The Chicago". Play with both forms over shuffle and straight backing tracks! Daniel covers one more chord-based blues comp as well as many riff-based comp ideas for the quick change blues. He then goes on to introduce the 5 positions of the Blues Scale. Daniel introduces the Hybrid Blues sound and uses two B. B. King "boxes" to illustrate some ways that it can be applied. Learn the minor seventh arpeggio shapes and how to apply them over a couple of different chords. Apply these arpeggios over the provided backing tracks. Taking all of the arpeggios learned so far, Daniel takes you through two chord progressions and demonstrates many ways to apply the patterns musically over backing tracks. Saving the three note arpeggios for later in his series was a strategic one. They are actually harder to play! Once you have the seventh arpeggio shapes down, start getting these shapes in your fingers! Daniel begins by teaching the basic CAGED minor arpeggio patterns and then shares an etude that provides a beautiful musical context with which to apply some of the shapes covered so far. Daniel teaches the fully diminished 7th arpeggio shapes and explores several ways of applying them over chords and progressions we use every day. Daniel teaches the CAGED Lydian patterns, some tasteful phrasing ideas, and explores some chords and progressions that are appropriate for the Lydian mode. 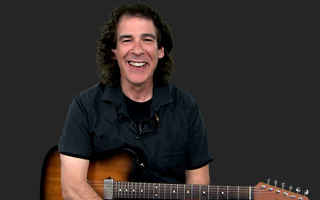 Being one of Daniel's favorite sounds, he takes extra care in explaining and demonstrating the Mixolydian mode. Learn the patterns, some musical phrases and put it all together with a backing track! Daniel wraps up his mini series on modes by teaching you how to play over two different modal backing tracks. Learn how to switch between modes and keys and apply scales as well as arpeggios. Daniel explores some conventional and unconventional ways to use triads over an A7 chord and an Am7 chord. When added tastefully, triads really spice up the old blues and pentatonic scales. Advanced Blues: "A La Carte"
Daniel now takes this series to the next step. Here he explains where this series will take you in your improvising techniques. Daniel explains some practice techniques that will enable you to improvise over a key change of a whole step. Learn some practice techniques that will help you improvise over two different key centers that are a minor third apart. This lesson is all about intervals, specifically switching between keys that are a major third apart. In this very detailed oriented series, Daniel now discusses some unique ways to use the A minor scale to you improvisational advantage. Here, Daniel covers ii-V-I progressions and explains some scale choices that can be used when improvising over them. Still sticking within the ii-V-I progression, Daniel delves much deeper into the scale options available when improvising a solo. Daniel will mellow things out by demonstrating how to play over ii-V-i progressions in minor keys. This lesson diverts into more of a chromatic direction. Learn how to incorporate basic chromatic ideas over the ii-V-I. About Daniel Gilbert View Full Biography Veteran Musician Institute guitar instructor brings his 35 years of guitar classroom teaching experience to JamPlay! His playing and perspective on the guitar will help anyone excel in their journey to become a better, well-rounded musician.